Peregrine falcon (Falco peregrinus) populations around the world experienced massive declines during the 1960s and 70s due to organochlorine pesticides moving up the food chain, causing egg shell thinning. 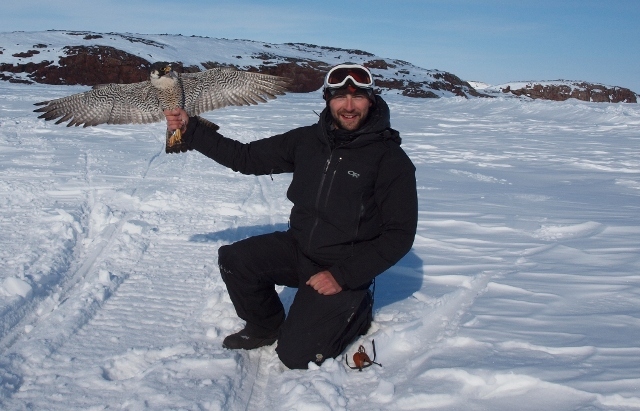 The deleterious effects of these pesticides on the Arctic peregrine falcon (F. p. tundrius) – a subspecies that breeds in the Arctic regions of Canada, the USA, and Greenland – received less documentation than other subspecies. However, tissues taken from Arctic peregrine falcons breeding around Rankin Inlet, Nunavut, in the early 1980s indicated that organochlorines were present in Canadian Arctic ecosystems. Yearly monitoring of the Rankin Inlet population has been ongoing since 1982, and data show that pesticides loads have been declining and are now below toxic threshold levels. Nevertheless, the number of chicks produced by this population is declining each year and the specific cause is unknown. Our research group (www.arcticraptors.ca) is currently examining a series of hypotheses to determine the cause of the decline in productivity. 1. Which landscape features do peregrines use to select foraging sites and how do they select from a variety of prey types? 2. How do variations in different prey assemblages influence breeding behaviour and performance? 4. Do back-pack style GPS transmitters influence breeding behaviour and performance?